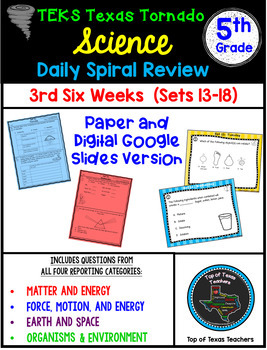 •This book was written to use for Science Spiral Review in 5th Grade. This is the 3rd part of five parts and has enough work to last 6 Weeks. It was created based on the most up-to-date streamlined TEKS and helps students be STAAR ready! There is a discounted bundle available as well at this link: Bundle. This is the Google Slides Digital Version. It includes the paper version as well as a link to the Google Slides version that can be assigned to your students through Google Classroom. 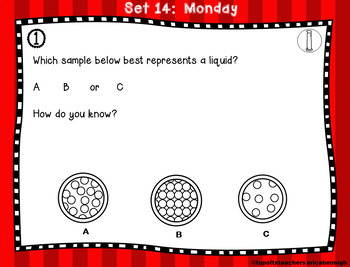 •The questions are intended to help give a QUICK review of the basic skills needed and are most are not in test format. These problems will help keep science concepts from all the reporting categories “fresh” in students’ minds throughout the year. The beginning of the year will start out with review of 3rd and 4th Grade standards and progressively get more difficult and add in 5th grade standards. There are 2 boxes to complete each day for four days: Monday-Thursday. Some boxes have more than one question in them. •On Monday and Wednesday, Reporting Category 1: Matter and Energy and Reporting AND Category 2:Force, Motion, and Energy are covered. •On Tuesday and Thursday, Reporting Category 3: Earth and Space AND Reporting Category 4: Organisms and Environment are covered. 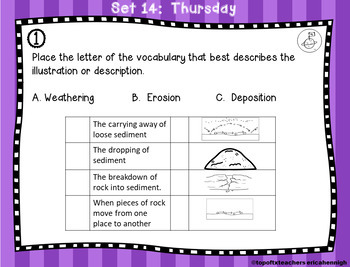 •It was created to be a quick “Bellwork” assignment, but there are lots of other ways to use it in a classroom. It could be a work station or center activity as well. 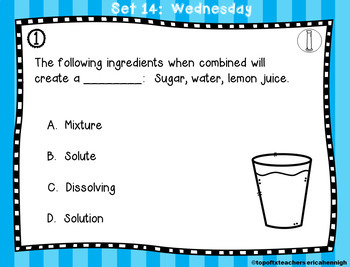 The questions could be cut up and used as task cards or as Exit Tickets. •We like to check the problems with the students shortly after they have completed them, so they get the quick feedback. •SCORE SHEET:You can track students’ progress for intervention and reteaching using the “Score Sheet” that is included. If you have any questions, or find an error, please contact us at topoftxteacher@gmail.com. You can follow us on TPT to receive an email when the next parts are released.